Candelario Salais and crew constructed our new tricycle track in January. 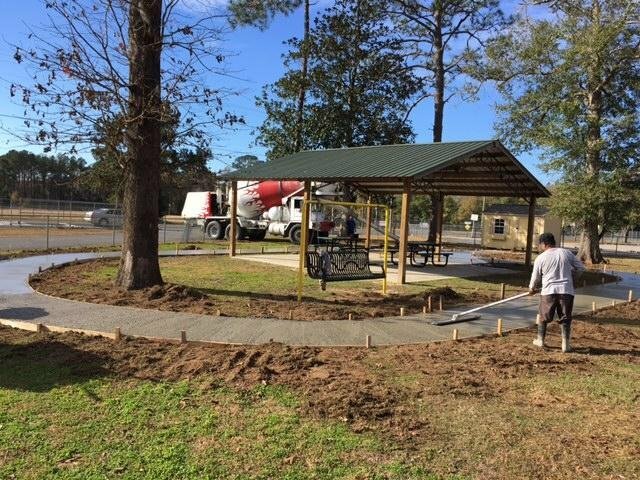 We are thrilled to announce that Greensboro Elementary has been awarded $5,000 for the construction of a tricycle track around a portion of our playground. Ms. Holle Boykin, Pre-K teacher, applied for a Lowe's Toolbox for Education grant in hopes of being able to construct the track to enable our youngest students to not only get more exercise and improve gross motor skills, but to reinforce the social skills of sharing and taking turns. As soon as the funds were awarded, local contractor Candelario Salais and his crew got to work, completing the track construction over a weekend in January. School Principal Stephen Pitts also contributed to the project and helped purchase a storage shed to house the tricycle fleet as well as other primary playground equipment. Mr. Pitts commented, "I'm pleased with how it turned out. We really appreciate our friends at Lowe's for helping this wish become a reality. The boys and girls of the Greensboro Community will benefit by having a fun and safe place to play."